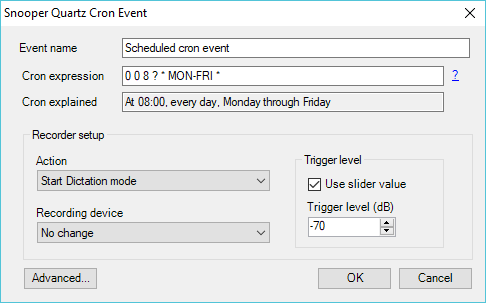 The Cron format is a well-know powerful and flexible way to define time and frequency of an event. 0 0 6 ? * MON Fire every Monday at 06:00. 0 0 22 ? * 1-5 Fire at 22:00 on Mon, Tue, Wed, Thu and Fri.